Randie Soul is back with more pictures of Tokyo Disneyland! This time it's all about Adventureland, and we'll begin by the new skow at the Tiki Room with Stitch. The marquee at the entrance clearly indicate the new show title: "Aloha e komo mai!". A nice addition is the Stitch vehicle in the Tiki room garden. Guests can immediately understand that Stitch landed at TDL! Visitors are also informed about Stitch thanks to other outside elements like this one. The Stitch audio-animatronic during the show is pretty big - may be a little bit too big in comparison with the birds? Here is an excellent Youtube video of this new Stitch show filmed by the always good JTcent - and with english subtitles! Tokyo Disneyland also have a Polynesian Terrace. Even food carts are themed, and each of them in the park have their own specialty. For instance, this one is selling chocolate popcorn, and it is the only one selling these. Some pictures of scenes of the Swiss Robinsons Tree. I am always amazed with the maintenance quality at TDL. If you look at the plates, fruits, and other elements on these three scenes everything is incredibly clean, no dust, nothing, just like new. Incredible. The Tiki Room building, as you can see it from the Swiss Robinsons Tree. Or even the Tower of Terror located far away, at Tokyo Disney Sea! 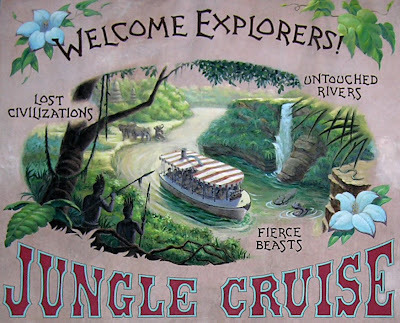 Here is the Jungle Cruise entrance! 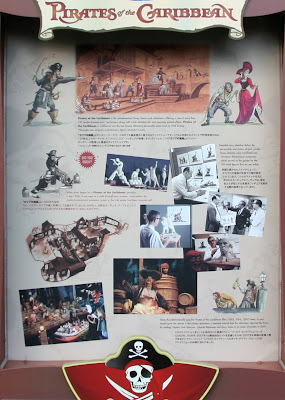 Here is an interesting poster at the entrance, with old renderings and pictures of imagineers at work on the attraction. ...and the marching band walking through New Orleans Square! All the pictures above are in hyper high-res and some would be great as wallpaper for your computer screen! More of this Randie Soul Tokyo Disneyland report coming next week! All pictures: copyright Randie Soul whom i thanks a lot! Youtuve video by JTcent whom i thanks a lot, too! They've ruined Walt Disney's Enchanted Tiki Room in 2 parks. Well done. thanks for posting these. TDL really appears to be the best-kept park of all, just like Walt would want all of his parks to look. sadly, maintenance quality at the American parks has slipped and was never too great at DLP (can't say how HDL stacks up). Adventureland looks gorgeous, though much as i love Stitch, this may be an even worse desecration of the wonderful Tiki Room than the "under new management" outrage of WDW. Having seen both the Stitch Tokyo version and Under New Management versions in person, I can definitely say that Under New Management is far worse. Of course, the original is much better than either of the new shows in my opinion. I think "Under New Management" is great and does not deserve the negative flack that it gets in Disney fan circles such as this. I also feel that UNM does a WAY better job in paying homage to the original show than either "Aloha e Komo Mai" or its predeccesor "Get the Fever". If you knew the names of the Imagineers that created UNM, you'd be shooting yourselves in the foot right about now, regretting saying nothing but nasty things about WDI veterans. But still, the WDW and TDL Tiki Rooms are NOT ruined! To say that they are is a MAJOR overexaggeration. And a lot of you purists don't even like "clones" anyway, so let the different parks over the different versions of the show and stop beating this long-dead horse. Where will you be on December 21 , 2012 ?